I’m sipping creative juices from my fellow blogger and kindred spirit over at Ann’s Rants. I noticed that a recent post had the label “circus freak”. She was recalling some of her on-stage theatrical moments and the attending get-ups. I can relate, that’s me on the right (and, no, I’m not a natural blond but, yes, I was chewing gum and blowing a bubble when that photo was snapped). 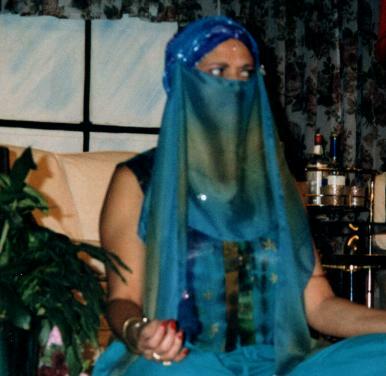 I’ve been performing in community theater for over 20 years. My costumes always consist of wild wigs, garish clothing that generally shines or glitters, gaudy beads and feather boas. People always seem not to believe when they ask, “Where did you find that get-up?” and I tell them it came from my closet. For me, community theater is an excuse to dress up and act out – all on account of an altar ego that’s been lurking inside me for as long as I can remember. Now, the older I get, the closer she comes to the center ring. When I was a kid, one of my favorite Dr. Seuss books was “If I Ran the Circus.” I wasn’t so much interested in running the circus as running away with it. I thought living in a wagon (okay, an RV) and traveling across the country with a band of equally eccentric make believers would be the life for me. No worries about acting a fool or past regrets ‘cause I’d always be leaving town the next day. Goodbye cruel world, I’m off to join the circus! My ancestors hail from south-central Europe. (The ruling governments and borders in the region have changed so frequently, let’s just say north of Greece and East of Romania). Wanderlust runs like blood in my veins. I just know I’d be a hit with the circus as the mysterious, veiled fortune teller. I’d probably have a thang goin’on with the lion tamer. I’ve always wanted a pet tiger. I almost made the break one day, back when I was very much stuck in the middle of my child raising years (talk about a three ring circus). My oldest was out of the nest but still ruffling my feathers. The middle child was testing her wings now that big sister’s shadow wasn’t blocking her time in the sun anymore, and the youngest was, well, young – and I was tired. A tiny little circus came to visit our tiny little town on a warm September weekend. In fact, I will never forget because it was the Labor Day weekend that Princess Di – died, proving that there are no real fairy tales and contrary to having it all, the best we can hope for is make believe. I dragged myself from beneath the covers where I’d retreated after the last exhausting battle with oldest child. Daddy, toddler and I trotted off to see the show. She was right. The saw dust and smell of greasepaint would have to wait until she at least graduated from high school . . . which happened two years ago this May! Last summer I bought a 1970-something travel trailer. My husband doesn’t believe me when I tell him I’m going to paint Gypsy Woman on the side in letters two feet tall. Oh ya, and the best thing about circus folk? They have their very own world in Baraboo, Wisconsin and they winter in Florida baby. Joining the circus. Is that one of the motifs that is common throughout time and place? Leaving the known, the boring, the expected for the road, the drama, the edge? My circus was going off to Israel. But even it became routine. The trick is keeping the desire for the circus alive and keeping the circus lady alive within, letting her out into the ring on occasion. Sara,Thank you for your kind compliments. Remember, life is the journey, not the destination – you’re in the thick of it.Laura,Friend, you always have such thoughtful insight to add. I am so glad we met. Israel for you, LA for your daughter. The circle never ends.